I've received so many wonderful, creative, generous swap packages over the last few years.... when I heard an angel was needed for The Big Bag Swap & KAL I figured I'd help out. When I found out it was Brenda who needed an angel, it seemed so appropriate that I would be doing this for her. See, Brenda has been my "spoiler" for two knitting swaps (one of which was The Big Bag). This angel project was a bit bigger than a normal swap. That's because, in addition the normal goodies in the package, you needed to knit and then felt a large bag. A bit of work! But I love making bags, so it was lots of fun as well. I wanted to make this as quickly as possible because I knew she'd already been waiting several months for her package. So I bought some brightly colored (her choice) yarn and JoAnn's and started knitting. 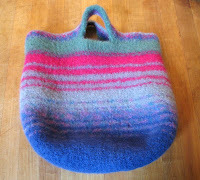 The bag took a little over a week to complete -- drying it after felting took the longest in this humid summer weather. In addition to the bag, I tucked a bunch of goodies that she specifically requested into the bag. I hope you enjoy it all Brenda! Is there any knitting tool, book, or yarn that you would like to have but have never bought for yourself? Something that you would like to try?